Thousands of UPTE-CWA members have voted overwhelmingly to authorize a strike at the University of California in support of the AFSCME PCT Unit. UPTE members are ready to fight as long and as hard as it takes for UC to treat students, patients, and their co-workers in the PCT Unit with the respect they deserve. AFSCME has announced that their PCT workers will strike from October 23-25. UPTE's HX, RX, and TX members will be striking in solidarity. UPTE members are more committed than ever to making sure that all UC workers are treated with justice and dignity, and that UC serves the interests of students, workers, patients, and the community – not just Chancellors, CEOs, and Regents. Learn more about the October 23-25 solidarity strike here. Management for Digital First Media, speaking for its corporate masters at the New York vulture fund Alden Global Capital, rejected a modified wage proposal last week by the unions that comprise the DFM Caucus, including NewsGuild-CWA. Management made no counterproposal after rejecting the unions' modified wage proposal, which called for a raise of four percent effective July 1 of this year. DFM earned $160 million in profit last year, twice what other newspaper companies typically earn, but most DFM workers have not had a wage increase for more than two years. 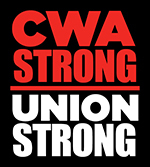 Union members have resolved to continue the joint union campaign. Flight Attendants at charter airline Miami Air, represented by AFA-CWA, voted overwhelmingly last week to ratify a new contract. The five-year agreement provides immediate pay raises and a per diem, and improved work rules for more than 100 Flight Attendants. "Miami Air Flight Attendants stood together throughout negotiations and a year ago authorized a strike, if necessary. We ratified a new contract that will provide much needed wage increases for Flight Attendants and their families," said Natasha Glasper, AFA-CWA Miami Air President. Workers at the Duquesne Club in Pittsburgh, members of CWA Local 13500, ratified a new four-year agreement covering 125 employees, which includes wage increases and improvements on health care, retirement, vacation allowance, and other working conditions. In honor of Customer Service Appreciation Month in October, CWAers participated in a second annual Customer Service Week of Action. 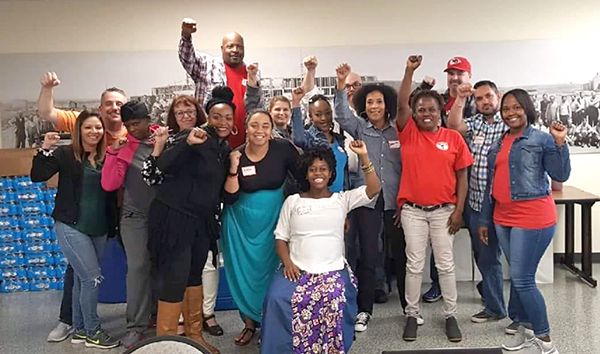 During the week of action, CWA members in customer service across the country exercised their voices to build worker power in workplaces and the community by taking political action for strong pro-labor candidates. 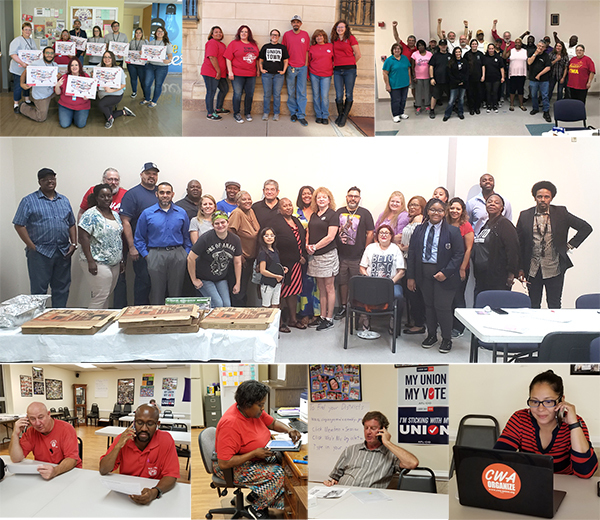 Forty local unions registered to take action during the Week of Action and nearly 300 customer service members turned out to phone bank, canvass, text and more! 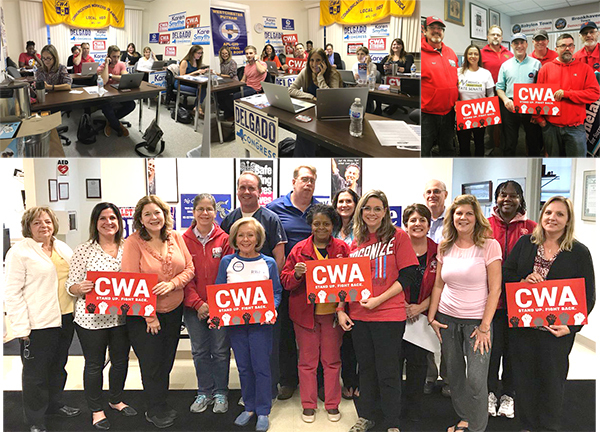 CWAers across New York are going all out to help elect pro-worker candidates like Anthony Brindisi, Antonio Delgado, Perry Gershon, and Nate McMurray for Congress; Monica Martinez and Karen Smythe for State Senate; and more. Members of Local 9413, including officers and stewards, have been out canvassing to help elect Steve Sisolak for Governor, Jacky Rosen for U.S. Senate, and to elect pro-labor candidates in key congressional, state legislative, and local races. 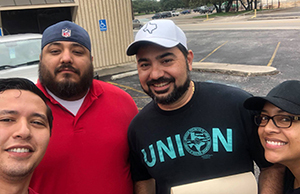 CWA Local 6143 members knocked on doors to re-elect pro-worker State Rep. Philip Cortez. CWA members from Locals 6009, 6016, and 6327 gathered in Oklahoma City for a two-day CWA Political Action Boot Camp. The two days were spent talking about the ongoing class war, building skills to organize, and planning strategy for future fights. The participants set up a six week activist plan to take the skills they learned back to their respective locals and put them to use. CWA District 9 has filed a motion with the California Public Utilities Commission (CPUC) seeking to represent the interests of workers and consumers during the state's review of the T-Mobile/Sprint merger. "The merger would result in nearly 3,200 job losses in California and more than 28,000 job losses across the country," said District 9 Vice President Tom Runnion. "Meanwhile, the reduction in competition would lead to higher consumer prices, especially for price-conscious pre-paid wireless customers." Earlier this month, CWA members drew attention to T-Mobile and Sprint's misleading claims about job creation as a result of the merger at a rally outside of Sprint's headquarters in Overland Park, Kan. In addition to engaging in the review process in California, CWA is urging the Federal Communications Commission to reject the merger unless it includes verifiable and enforceable commitments that no T-Mobile or Sprint employees will lose their jobs as a result of the merger. The FCC must also ensure that the companies will commit to return all overseas customer call center jobs to the U.S., abide by all labor and employment laws, and maintain neutrality in allowing their employees to form a union of their own choosing, free from any employer interference.